Long before my six years in Vegas that recently ended, I lived there for two years, 1980-82. 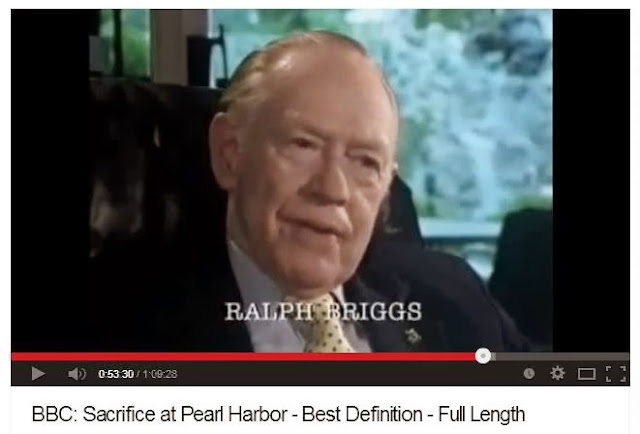 During that time, I got to know a man in Henderson named Ralph Briggs. He told me once that he had been a Navy radio operator. He said that several days before December 7, 1941, he had intercepted a message from the Japanese fleet about an attack soon to be launched. He dutifully passed the message up the chain of command, then was on leave when the attack occurred. He later learned that the message he had intercepted had been ignored, and, as a result, Pearl Harbor was not at all prepared for the attack. Even though I judged him to be an exceptionally honest, honorable man, frankly I assumed that he must be pulling my leg--not because I knew anything about the subject, but just because it seemed astronomically unlikely that I happened to know the one guy whose message, if heeded, would have changed the outcome of the single most pivotal event in 20th-century history. There are always more pretenders than real heroes, more people claiming to have been watching the JFK motorcade in Dallas than were actually there, etc. I have since learned that his story is hotly disputed. Some writers take him at his word, and accept that the lack of expected documentary evidence to support his account is because of later tampering with the records as part of a cover-up. See, for example, a relatively short book chapter devoted to the whole affair, readable via Google Books here. On the other extreme, some say that his account is "too full of holes to hold up to much scrutiny." I have no way of knowing where the truth lies. Maybe he really was the Paul Revere of his time whose message was tragically disregarded. Maybe he was a crackpot, trying to claim for himself a place in history that he didn't deserve. Maybe he was sincere but wrong, as memories can become distorted by time and subsequent events. For example, maybe he really did intercept and pass on a message, but it was rightly ignored because it was not, in fact, anything of military significance, and he retrospectively imbued it with content and/or meaning that it did not have. Whatever the truth, it is, at least, an interesting story. In fact, that we cannot now know what really happened kind of makes it more interesting. Absent strong evidence, which seems unlikely ever to come forth, I would never swallow the extreme conspiracy theory that Franklin Roosevelt had specific knowledge of the impending attack and squelched it so that Americans would be provoked into supporting his desire to get involved in WWII. However, I find it entirely plausible that, as with September 11, 2001, there were a multitude of clues which our various intelligence services failed to assemble and interpret correctly. I also think it's plausible that some such clues were later swept away to prevent political embarrassment. I certainly don't know that this happened, but it would hardly be the most nefarious thing the military brass ever did. Today I got wondering if Ralph was still alive. It seemed unlikely. Sure enough, I found his 1998 obituary in the Chicago Tribune, here. So he was already dead by the time I was discovering that I was far from the only one who had heard his claims. It is, in fact, a well-known little curiosity among both conspiracy buffs and serious historians of that chapter of American history. I spent a few hours again today watching some documentaries on Pearl Harbor, which is what prompted this little trip down memory lane. I think it's impossible not to be moved by the stories of both heroism and loss. To all those, living and dead, who experienced that awful day firsthand, and to the memory of Ralph Briggs, I offer my thanks.